Guo Bin Li Cha is a special type of Mao Feng tea produced by "Xie Yu Da", a very old and important tea company (since 1875) from An Hui province that was founded by the creator of Huang Shan Mao Feng, Mr. Xie Zheng'an. It is still regarded as the top Huang Shan Mao Feng producer in China today, being the only tea company that holds the secret of Huang Shan Mao Feng traditional processing technique. This tea is special because of the many great teas to come from An Hui province; it is selected as the gift tea to be presented to the Chinese Central Government to serve as gift tea to foreign VIPs. In year 2007, Chinese President Hu Jintao personally presented this tea to Russia's former President, Vladimir Putin when he visited China. The name "Guo Bin Li Cha" translates to "National Guest's Gift Tea". The tea leaves are hand-picked between 24 to 27 March, the earliest date for Mao Feng picking. Only the first flush is used in making Guo Bin Li Cha. This product is certified organic by An Hui Province Zhong Xing Product Certification Company. The dried leaves have an interesting bamboo/woody fragrance. The tea is highly refreshing and delicious with sweet floral taste and a complex aroma. 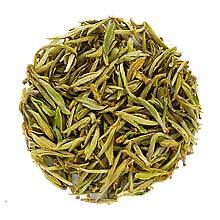 Emerald green young and tender tea leaves consisting of a mixture of one-bud-one-leaf, and one-bud-two-leaves variety. To those familiar with the term, the shape is known as "Bird's tongue".